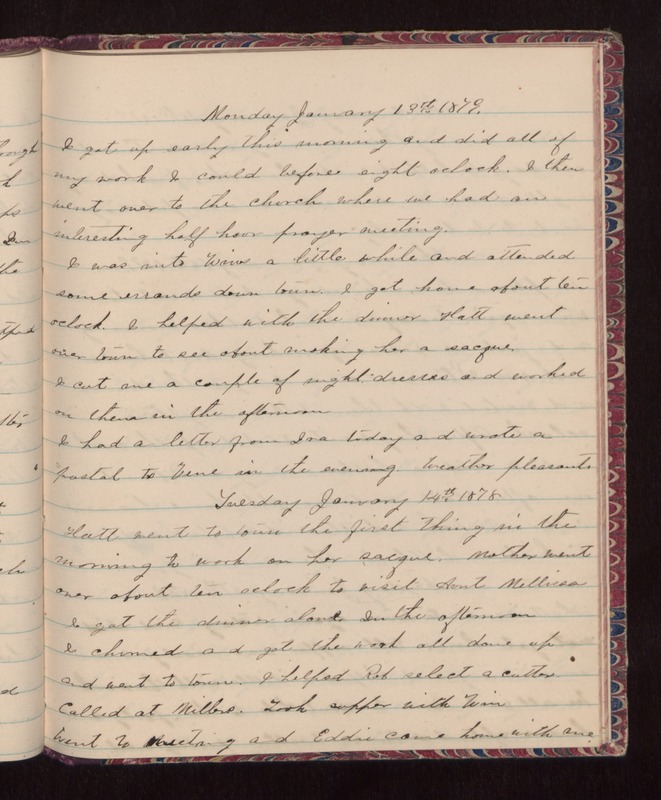 Monday January 13th 1879 I got up early this morning and did all of my work I could before eight oclock. I then went over to the church where we had an interesting half hour prayer meeting. I was into Wins a little while and attended some errands down town. I got home about ten oclock. I helped with the dinner. Hatt went over town to see about making her a sacque. I cut me a couple of night dresses and worked on them in the afternoon. I had a letter from Ira today and wrote a postal to Vene in the evening. Weather pleasant. Tuesday January 14th 1879 Hatt went to town the first thing in the morning to work on her sacque. Mother went over about ten oclock to visit Aunt Mellissa I got the dinner alone. In the afternoon I cleaned and got the work all done up and went to town. I helped Rob select a cutter Called at Millers.Took supper with Win Went to meeting and Eddie came home with me.